We’d love your help. Let us know what’s wrong with this preview of Remarkable Hope by Shauna Letellier. Rediscover eight people in the Bible whose hopes and expectations went from disappointment to life-changing transformation through Jesus. Remarkable Hope reveals a pattern of hope where individuals were surprised by Jesus in drastic ways after they placed their hope in him and were--at first--disappointed. Their stories show his work was rarely what they anticipated. To ask other readers questions about Remarkable Hope, please sign up. Are you struggling to feel hopeful? Feeling like God doesn't hear you? Check out Remarkable Hope by Shauna Letellier. This new book is full of Bible stories where people lost all hope--but God came in towards the end of the story and everything changed. In Remarkable Hope, Letellier reminds readers of the stories of John the Baptist, the demon-possessed man, Jarius whose daughter was dying, Martha and Mary as Lazarus was dying, Peter walking on the water and more. In each of these stories, Letell Are you struggling to feel hopeful? Feeling like God doesn't hear you? Check out Remarkable Hope by Shauna Letellier. This new book is full of Bible stories where people lost all hope--but God came in towards the end of the story and everything changed. In Remarkable Hope, Letellier reminds readers of the stories of John the Baptist, the demon-possessed man, Jarius whose daughter was dying, Martha and Mary as Lazarus was dying, Peter walking on the water and more. In each of these stories, Letellier retells the Bible story so the reader feels like they are right there with them--feeling the hurt and disappointment of a story that isn't going like they wanted it to. Then God changes things in an instant, but not exactly when it was expected. I enjoyed reading Remarkable Hope. The Bible stories were brought to life so well that I felt like I was living them along with the characters in the stories. One other story she shares is about missionary Darlene Diebler Rose, who is from my hometown, so I know this story well. It is such a great reminder of how God cares for us in the little things and hears us even when we feel alone. At the end of the stories and at the end of Remarkable Hope, I did feel some renewed hope and possibilities in my own stories. I think most readers will feel similarly if they give the book a try. Shauna Letellier has written a book just for you! Because hope is something we all need, but it’s often misunderstood. What does it mean to truly place our hope in Christ? And what do we do when hope seems lost, and it feels like our Father isn’t listening? I’ve been in that place, and I can tell you the wisdom from this gem shows us what we need most during the dark times. Shauna has retells stories straight from the pages of scripture, and you’ll find glimpses of yourself in these narratives a Shauna Letellier has written a book just for you! Because hope is something we all need, but it’s often misunderstood. What does it mean to truly place our hope in Christ? And what do we do when hope seems lost, and it feels like our Father isn’t listening? I’ve been in that place, and I can tell you the wisdom from this gem shows us what we need most during the dark times. Shauna has retells stories straight from the pages of scripture, and you’ll find glimpses of yourself in these narratives as well. Have you ever suffered disappointment? We can give names to it, can't we? Failed marriage. Prodigal children. Lost job. The untimely death of a loved one. In Remarkable Hope, Ms. Letellier shares stories from God's Word when Jesus revived hope in disappointed people. Hope is the red cord that weaves itself from the Garden of Eden all the way to the end of The Book - it is the eternal hope of glory. Shauna writes on long-expected hope, questioning hope, redirected hope, despairing hope, delayed ho Have you ever suffered disappointment? We can give names to it, can't we? Failed marriage. Prodigal children. Lost job. The untimely death of a loved one. Hope is the red cord that weaves itself from the Garden of Eden all the way to the end of The Book - it is the eternal hope of glory. Shauna writes on long-expected hope, questioning hope, redirected hope, despairing hope, delayed hope and several more. I recommend this book to anyone who needs a new dose of the Hope vaccine! We experience a string of catastrophes and we wonder about the hope we are to have in the promises of God. Hope is to be the anchor of our soul but we feel like our boat is capsizing. We are overwhelmed by disappointment. Letellier shares her teaching on hope in a unique way. She expands on stories from the gospels, adds a teaching and then a prayer. Her stories are of people experiencing disappointment in their relationship with Jesus. There are Simeon and John the Baptist. Both had expected a l We experience a string of catastrophes and we wonder about the hope we are to have in the promises of God. Hope is to be the anchor of our soul but we feel like our boat is capsizing. We are overwhelmed by disappointment. Letellier shares her teaching on hope in a unique way. She expands on stories from the gospels, adds a teaching and then a prayer. Her stories are of people experiencing disappointment in their relationship with Jesus. There are Simeon and John the Baptist. Both had expected a liberating Savior. Simeon saw a baby and John saw the inside of a prison cell. Mary and Martha expected Jesus to come immediately and heal their brother Lazarus but watched him die instead. The disciples on the way to Emmaus had expected great things but wondered if they had believed in a false Messiah. Letellier tells eight stories. My favorite story was of Jairus. Letellier began her story showing how Jairus cared for the synagogue. She caught me up in Jairus' emotional desire to have Jesus heal his daughter and the pain he must have experienced when the notice came she had died. How irritated he must have been at Jesus' delay by healing the bleeding woman. How disappointed he must have felt, thinking all was lost. I like her teaching after each of the stories. She helps us understand God does not always remove the trials. God's timing is not ours. We think it is too late and surely God has abandoned us. Yet in the end we receive more than we could ever ask or think. This book is good for people puzzled by the unpredictability of God. It is good for people who like to learn through stories. It is good for people who want to learn how to dive into a Bible story through imagination. Letellier challenges us too, such as in the story of Peter walking on the water. Our we devoted to Jesus Himself or to what we think He should be doing for us? I like this way of teaching but I do have one caveat. I am always a bit hesitant with fictionalized accounts of Jesus and His ministry. Imagining what Jesus might have said and putting it in print makes me nervous. I do recommend this book, however, as an innovative way to gather glimpses of how God revives hope in a way we could never have imagined. Remarkable Hope is a powerful story about believing in the hope of Jesus in the ordinary and extraordinary experiences of disappointment. Shauna Letellier’s beautiful retelling of eight Bible stories gives the reader a true sense of the character’s experiences and highlights the depths of their disappointments, fears, doubts, and wavering hopefulness. Her descriptive storytelling provides a deeper understanding of what each Bible character encountered and how they were transformed. I found Shaun Remarkable Hope is a powerful story about believing in the hope of Jesus in the ordinary and extraordinary experiences of disappointment. Shauna Letellier’s beautiful retelling of eight Bible stories gives the reader a true sense of the character’s experiences and highlights the depths of their disappointments, fears, doubts, and wavering hopefulness. Her descriptive storytelling provides a deeper understanding of what each Bible character encountered and how they were transformed. I found Shauna’s overlay of fiction woven into the Biblical stories fascinating! I appreciate the level of research that obviously went into the writing of this book to make the stories come truly alive! I think we’ve all experienced disappointment in our lives, in varying degrees, and wondered if we could remain hopeful. Remarkable Hope emphasizes that no matter the depths of disappointment we encounter, Jesus is our Living Hope. Shauna walks the reader through the layers of hope within each Biblical story, in the chapters of Long-Expected Hope, Questioning Hope, Redirected Hope, Despairing Hope, Delayed Hope, Doubting Hope, Unimaginable Hope, and Confused Hope. I love how Shauna goes deep into the Bible stories and captures the essence of what each person struggled with and also keeps the reader fully immersed and vividly engaged within the storylines. The chapter on Delayed Hope, the story of Mary, Martha, and Lazarus, really resonated with me. How many times have I felt my prayer requests were being denied or ignored, but actually they were lovingly delayed in God’s perfect timing? I truly loved Remarkable Hope! It refreshed my spirit and unearthed aspects of my relationship with Jesus I hadn’t considered before. I feel I have a better understanding of the Biblical stories and the depth and breadth of God’s love. I think you’ll come to love Shauna Letellier’s beautiful and powerful writing style and her messages of hope, the hope we all so desperately need. I was blessed by Shauna’s amazing book of Remarkable Hope. 'Remarkable Hope' is just the kind of book I like to read. I like books which focus on the men and women of the Bible and which help us to understand their lives a bit better and the culture they lived in. There is so much to learn from these Biblical characters which can be of benefit to us in our personal journey with God. Shauna uses her knowledge and understanding of the Bible, insights she has gained from studying it, research she has undertaken and her God-given gift of imagination to brin 'Remarkable Hope' is just the kind of book I like to read. I like books which focus on the men and women of the Bible and which help us to understand their lives a bit better and the culture they lived in. There is so much to learn from these Biblical characters which can be of benefit to us in our personal journey with God. Shauna uses her knowledge and understanding of the Bible, insights she has gained from studying it, research she has undertaken and her God-given gift of imagination to bring us a creative retelling of the lives of various Bible men and women. As I read this book, I realised afresh how these men and women are just like you and me with their strengths and weaknesses, their fears and faith, their doubts and their hope. Through it all shines the truth that our hope truly is in God alone. A God who often works in unexpected ways. In ‘Remarkable Hope’ we read about some of the events in the lives of Simeon, John the Baptist, Jairus, Mary, Martha and Lazarus, Peter, Mary the Mother of Jesus and the two disciples on the Emmaus Road. Each chapter ends with a beautifully worded prayer. Shauna’s book is more than just a retelling of the lives of these Bible characters. Out of her creative retelling, she provides the reader with spiritual insight and lessons to be applied to our own lives and the things we face. For me, this is what takes her book to another level. Because, to be honest, I don’t just want to read about the lives of these people, I want to learn from them. I want a book which helps take me further in my own faith in God. Have you ever put your hope in Christ only to find that the circumstances and answers to prayer He brings are not what you expected? In fact, the answers may have disappointed or grieved you for a time? I have. And when this book came into my hands, I found a beautiful, truthful walk through 8 stories of other believers in Scripture who also found Christ to be different than they expected. Shauna Letellier retells these eight stories in well researched, vivid and engaging language. Through them, Have you ever put your hope in Christ only to find that the circumstances and answers to prayer He brings are not what you expected? In fact, the answers may have disappointed or grieved you for a time? I have. And when this book came into my hands, I found a beautiful, truthful walk through 8 stories of other believers in Scripture who also found Christ to be different than they expected. Shauna Letellier retells these eight stories in well researched, vivid and engaging language. Through them, I walked the dusty streets of the New Testament with John the Baptist, Peter, and Mary. After each story, she explains the power and love of God toward His children when He shows up in their lives in unexpected ways. He desires to give us far more than we ask or think. After taking the reader through the footsteps of others who have gone before and expounding Scripture on our hope in those circumstances, she ends each chapter in a prayer. Losing hope is a reality for everyone at some point in this life. But hope can be revived. In “Remarkable Hope” author Shauna Letellier presents eight people from the Bible who lost hope in various situations. But through the faithfulness of Christ, these people witnessed the restoration of their hope in some surprising ways. I love the way Letellier presents these stories. First, the Bible passage is recounted. Then Letellier presents a fictional account of the passage, based on much historical Losing hope is a reality for everyone at some point in this life. But hope can be revived. In “Remarkable Hope” author Shauna Letellier presents eight people from the Bible who lost hope in various situations. But through the faithfulness of Christ, these people witnessed the restoration of their hope in some surprising ways. I love the way Letellier presents these stories. First, the Bible passage is recounted. Then Letellier presents a fictional account of the passage, based on much historical research. The sights, sounds, and smells are all there, and we are transported right to the event. I am a visual learner, so I especially appreciated being able to “see” it all as if I was there. Retelling Bible stories is tricky – the Bible gives us basic plots, but so few of the details we want to know. It’s necessary to fill in details with conjecture, but there’s a right way and a wrong way to do that. Some authors choose to build their stories from the ground up, twisting major details of the characters’ lives to fit the story they want to tell. In contrast, Shauna Letellier builds a solid framework with all of the essential facts the Bible gives us before she begins to decorate it Retelling Bible stories is tricky – the Bible gives us basic plots, but so few of the details we want to know. It’s necessary to fill in details with conjecture, but there’s a right way and a wrong way to do that. Some authors choose to build their stories from the ground up, twisting major details of the characters’ lives to fit the story they want to tell. In contrast, Shauna Letellier builds a solid framework with all of the essential facts the Bible gives us before she begins to decorate it with imagined details. And those details bring to life stories I’ve heard often enough to miss the miracle. I know the ending so well I don’t realize how hopeless it seemed for the characters. Remarkable Hope shows what it looked like from their perspectives – as if Jesus had dropped the ball, let them down, and completely failed to meet their expectations. But in truth, He never fell short of their expectations. He went so far above and beyond that they could hardly see it. If you’re feeling hopeless and disappointed with God, you need to read Remarkable Hope. It will remind you that God’s ways are higher than our ways and He is always working for our good, even when all the evidence points to the contrary. It will remind you that He always keeps His promises, and if it seems He hasn’t, we’ve misunderstood the promise. It will remind you to hope in Him even when you can see no reason to hope. Remarkable Hope is an inspirational book by author Shauna Letellier. This book tells of people from the Bible and how Jesus gave them hope. In this book you will find a series of biblical vignettes. Did this book meet my expectations? I wasn’t sure what to expect, perhaps some bul Remarkable Hope is an inspirational book by author Shauna Letellier. This book tells of people from the Bible and how Jesus gave them hope. In this book you will find a series of biblical vignettes. Did this book meet my expectations? I wasn’t sure what to expect, perhaps some bullet points on how to overcome disappointment. Instead, the author used poetic license describing the person’s trial to victory. Each chapter began with a bit of scripture, then the author would describe that piece using story form, and each chapter ended in prayer. So, overall, was I pleased with the reading and would I recommend it. Yes & Yes! I love the cover of this book and it was one thing that drew me to read this book. Whether you are in a bright and sunny season or your lamp of faith is flickering, this book is for you. In Remarkable Hope, Shauna Letellier shines the light of truth in the places of our hearts where hope is hidden. Beautifully illuminating stories from scripture, Shauna reminds us that though these men and women looked into the very eyes of Jesus, they also searched for hope just as we do - and found it in him. We can relate to these whose sandals walked the earth long before us as they experi Whether you are in a bright and sunny season or your lamp of faith is flickering, this book is for you. In Remarkable Hope, Shauna Letellier shines the light of truth in the places of our hearts where hope is hidden. Beautifully illuminating stories from scripture, Shauna reminds us that though these men and women looked into the very eyes of Jesus, they also searched for hope just as we do - and found it in him. We can relate to these whose sandals walked the earth long before us as they experienced Jesus working in unexpected ways, just as we do. This excerpt is my favorite from the book, a little light bulb sparked on when the words jumped off the page at me. “What a beautiful mingling of certainty and surprise, of fulfillment and an unexpected twist. It is the promise of God we count on and expect, but it is his divine right and pleasure to surprise us even while doing exactly what he said. It’s why the apostle Paul praised God by saying: “Now to him who is able to do immeasurably more than all we ask or imagine, according to his power that is at work within us, to him be glory in the church and in Christ Jesus throughout all generations, for ever and ever! Amen.” (p. 25). I was a big fan of Shauna’s first book Remarkable Faith, so I didn’t hesitate to pre-order this book Remarkable Hope as soon as I could. I love the way she brings stories to life, “laying the fabric of fiction over the framework of Scripture”. There are eight stories included in the book: (1) Simeon, (2) John the Baptist, (3) a demon-possessed man, (4) Jarius, (5) Mary, Martha and Lazarus, (6) Peter, (7) Jesus’ Mother Mary, and (8) the two disciples on Emmaus Road. All these people hoped in Chri I was a big fan of Shauna’s first book Remarkable Faith, so I didn’t hesitate to pre-order this book Remarkable Hope as soon as I could. I love the way she brings stories to life, “laying the fabric of fiction over the framework of Scripture”. There are eight stories included in the book: (1) Simeon, (2) John the Baptist, (3) a demon-possessed man, (4) Jarius, (5) Mary, Martha and Lazarus, (6) Peter, (7) Jesus’ Mother Mary, and (8) the two disciples on Emmaus Road. All these people hoped in Christ and experienced disappointment, confusion, and devastation… and in all of these instances Jesus transformed their disappointment into something beyond what they expected or imagined. I’ve wrestled with the meaning of hope and the ways we throw the word around in insignificant ways. But what Shauna offers is not a shallow hope. It’s a deep, significant hope, grounded in a Savior who promises never to leave us or forsake us. If you are a new Christian, diving into the Bible for the first time, this would be a great book for you to begin to fall in love with Scripture. If you, like me, have read the stories many times, this is an amazing book to discover new details, to learn from a new angle and see with fresh eyes. A beautiful book of hope I wish was in print long ago! In the days and weeks following my paralysis, I heard that statement more times than I care to remember. I would ask my family and friends: “What does that mean? I don’t know how to feel anything but hopelessly. I was a paralyzed mother of 7 young children, that’s about as hopeless as it gets. Then one day my pastor told me to search the A beautiful book of hope I wish was in print long ago! Then one day my pastor told me to search the Bible for stories of transformations made through enormous trials. Stories of unwavering hope and steady faith in the face of unimaginable loss and pain. Shauna Letellier’s book does the work for you. Remarkable Hope uncovers tales of hope and faith and details beautifully how through Jesus all things are possible and hope is limitless. Shauna uses 8 well loved Bible stories with a thoughtful and creative devotion on each storie’s message of hope and how to apply it to yourself and situation. At some point or another in our lives, we will all face disappointment, discouragement or loss of hope. How we face it and who we face it with, can be the game changer. Remarkable Hope is the kind of book that I love to read. It points the reader back to scripture. What does it truly mean to put our hope, faith and trust in the Lord? And when it feels hopeless, is God really listening to our problems? Does He really care? I am in that season of life and I hope to move from it rather quickly, but At some point or another in our lives, we will all face disappointment, discouragement or loss of hope. How we face it and who we face it with, can be the game changer. Remarkable Hope is the kind of book that I love to read. It points the reader back to scripture. What does it truly mean to put our hope, faith and trust in the Lord? And when it feels hopeless, is God really listening to our problems? Does He really care? I am in that season of life and I hope to move from it rather quickly, but if I have learned about this season, I have learned He is listening and more than ever, it is the place where I lean into Him deeper and further than before. Not only do I lean into Him, I stay obedient. Remarkable Hope covers the stories of 8 people in the Bible who placed their hope in Jesus...expecting a certain outcome...and yet unmet expectations set them up for disappointment. Well...at first anyway. It was encouraging to me to read each story and see that Jesus was faithful to those who chose to place their hope in Him...in many ways He orchestrated circumstances above and beyond any expected outcome. The results transformed the lives of those who placed their hope in Him. Shauna's ability Remarkable Hope covers the stories of 8 people in the Bible who placed their hope in Jesus...expecting a certain outcome...and yet unmet expectations set them up for disappointment. Well...at first anyway. Shauna's ability to bring scripture to life in the retelling of each biblical story is masterful. She did her research and it shows. From the historical details, she has brought each character to life for us as we read. She begins with the scripture then brings it to life in the retelling, followed by application and prayer. I would recommend reading this book slowly... taking one chapter a day...reading, reflecting, and praying. Remarkable Hope presents eight memorable New Testament Gospel characters and imagines what they are thinking and feeling as they encounter Jesus. Each chapter presents one person by first giving the Biblical passage, then giving a short historical fiction expansion of the passage. The last part of each chapter is a reflection on Biblical hope from the passage and a short prayer. This is the second book by Shauna Letellier that I have read and I really enjoy her style. The fiction brings me into Remarkable Hope presents eight memorable New Testament Gospel characters and imagines what they are thinking and feeling as they encounter Jesus. Each chapter presents one person by first giving the Biblical passage, then giving a short historical fiction expansion of the passage. The last part of each chapter is a reflection on Biblical hope from the passage and a short prayer. This is the second book by Shauna Letellier that I have read and I really enjoy her style. The fiction brings me into the story and allows me to understand what each character may have been thinking and feeling. In this way it brings me closer to God. My only suggestion is to consider adding a group study component to the book with some discussion questions. "Our hopes and expectations in this world are shadows compared to the mysterious but secured hope of those who trust in Jesus." -Shauna Letellier. I was very encouraged by this book, which gave me the opportunity to learn from historical figures from the Bible as they walked through disappointing circumstances while still holding on to remarkable hope. This book really made you feel like you were a witness at the funeral of Lazarus, in the prison cell with John the Baptist, or in the boat in th "Our hopes and expectations in this world are shadows compared to the mysterious but secured hope of those who trust in Jesus." -Shauna Letellier. I was very encouraged by this book, which gave me the opportunity to learn from historical figures from the Bible as they walked through disappointing circumstances while still holding on to remarkable hope. This book really made you feel like you were a witness at the funeral of Lazarus, in the prison cell with John the Baptist, or in the boat in the middle of a raging storm with the disciples. I would recommend this book to anyone who has ever wondered why things did not work out how they hoped. This book reminded me that our hope in God is truly an anchor for our soul. This is the first book I've read by Shauna and I really enjoyed it. I loved how she took stories from the bible and brought you into the details of what would have been their daily lives--it was a good reminder that these were real people with hopes and dreams, struggles and disappointments and the amazing ways that Jesus showed up in each of their lives. She then took the truths gleaned from their stories and gave hope for the things we face even today. This book is for anyone who finds themsel This is the first book I've read by Shauna and I really enjoyed it. I loved how she took stories from the bible and brought you into the details of what would have been their daily lives--it was a good reminder that these were real people with hopes and dreams, struggles and disappointments and the amazing ways that Jesus showed up in each of their lives. She then took the truths gleaned from their stories and gave hope for the things we face even today. This book has a creative look at devotionals. Instead of the typical devotional setup of text then explanation, the author adds a creative writing part to her chapters. The book covers several people in the Bible who felt like they were being disappointed by God, and how their tales ended, with the author adding pieces to the stories by writing her creative take on how the characters were feeling or a background setting before the reveal that is omitted by the Bible. The writer's creative flare This book has a creative look at devotionals. Instead of the typical devotional setup of text then explanation, the author adds a creative writing part to her chapters. The book covers several people in the Bible who felt like they were being disappointed by God, and how their tales ended, with the author adding pieces to the stories by writing her creative take on how the characters were feeling or a background setting before the reveal that is omitted by the Bible. The writer's creative flare made the book even more enjoyable, adding another take (like a movie script) to parts of the tale that may only be a few paragraphs in the Bible text. "As Jesus sweat anguished drops of blood, God sent an angel not to deliver Jesus from suffering but to strengthen and revive him to finish the work. Jesus received glory and we received hope." What more proof could anyone ask for in times of despair or hurt but to know that someone loves you so much that they have given you Remarkable Hope. Loved this book, Shauna Letellier has given us a remarkable insight into people from the bible and how they might have felt without hope. Shauna has made Jesus "As Jesus sweat anguished drops of blood, God sent an angel not to deliver Jesus from suffering but to strengthen and revive him to finish the work. Jesus received glory and we received hope." Loved this book, Shauna Letellier has given us a remarkable insight into people from the bible and how they might have felt without hope. Shauna has made Jesus so much more available to us knowing that he understands our insecurities and frailties. I can’t love this book more! Shauna has done exactly what she said she would, she laid a fabric of fiction over the framework of Scripture. These powerful stories of normal people with their own set of problems that encountered Christ and found hope will keep you coming back for more. As you read these precious stories from God’s Word, friends, don’t be surprised if you are moved to tears as they come alive and you walk away with a determined heart to hold fast to the Hope of our calling in Chri I can’t love this book more! As you read these precious stories from God’s Word, friends, don’t be surprised if you are moved to tears as they come alive and you walk away with a determined heart to hold fast to the Hope of our calling in Christ! All of us experience times that are trying and hard. In the middle, we might look to God for His help. But He does not always respond as we expect Him to do. Featuring several specific Bible stories, the author illuminates the fact that while God cannot be controlled, He is in control. Most of all, He loves us. This book caused me to see areas of doubt where I need to trust and live in hope. Note: while I did receive a free PDF for reviewing purposes that did not affect my review. I intend on bu All of us experience times that are trying and hard. In the middle, we might look to God for His help. But He does not always respond as we expect Him to do. Featuring several specific Bible stories, the author illuminates the fact that while God cannot be controlled, He is in control. Most of all, He loves us. This book caused me to see areas of doubt where I need to trust and live in hope. Remarkable Hope is another great example, like her first book Remarkable Faith, of Shauna's gift for illuminating the Scriptures. I love how she pulled together these key stories about hope where Jesus surprised people. My favorite chapter was the one on Mary, Martha and Lazarus called "Delayed Hope." As someone who has experienced "delayed hope" in a very real way, I was encouraged and challenged by the way Shauna unpacks this story and the concept. I'm excited to share this book with friends a Remarkable Hope is another great example, like her first book Remarkable Faith, of Shauna's gift for illuminating the Scriptures. I love how she pulled together these key stories about hope where Jesus surprised people. 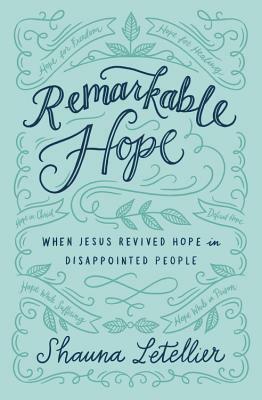 I've had the privilege to read an advanced copy of Shauna Letellier 's book, Remarkable Hope-When Jesus Revived Hope in Disappointed People. This book is a fresh look at Biblical Hope -- not the "I hope it doesn't snow again" kind but the "living hope that anchors my soul" kind of hope found in 1 Peter and Ephesians. The kind Paul declares in Romans that "does not disappoint". Friend, if you need to be reminded of this hope, here is a place to start. Shauna Letellier enjoys weaving strands of history, theology, and fictional detail into a fresh retelling of familiar Bible stories. She draws upon her Bachelors degree in Biblical Studies from Grace University in Omaha, Nebraska, as well as a variety of Bible commentaries to drape the fabric fiction over the framework of Scripture. Shauna’s writing has been published on The Huffington Post, Day Sp Shauna Letellier enjoys weaving strands of history, theology, and fictional detail into a fresh retelling of familiar Bible stories. She draws upon her Bachelors degree in Biblical Studies from Grace University in Omaha, Nebraska, as well as a variety of Bible commentaries to drape the fabric fiction over the framework of Scripture. Shauna’s writing has been published on The Huffington Post, Day Spring’s InCourage, and in MomSense Magazine (now Hello Dearest), a publication of MOPS International. Her first book "Remarkable Faith: When Jesus Marveled at the Faith of Unremarkable People" releases in May 2017. Shauna is a self-proclaimed expert second-guesser but finds certainty in knowing Jesus Christ. She blogs about finding rest and relief in Him at www.shaunaletellier.com. With her husband Kurt, she has the wild and hilarious privilege of raising their three boys along the banks of the Missouri River where they fish, swim, and rush off to ballgames.